A broken tooth or several teeth is one of the most common denture breakage issues. We can replace your denture teeth using your existing tooth, but if you’ve lost the tooth or it is too broken to reuse, we have many sizes and shades of denture teeth in stock which can be used to replace your missing teeth. If you have worn or discolored teeth, these can be replaced as well to give more life to your current dentures. Interested in denture repair? Ask us about a free consultation. 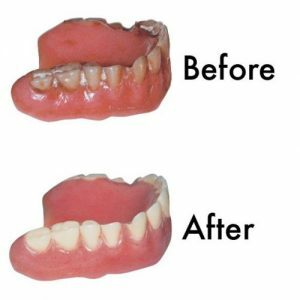 Our mission is to provide affordable, state of the art denture repair to patients everywhere! © 2019 Denture Helper. All Rights Reserved.